A while ago, while browsing through some AI articles – I came across this AI Index created to understand the current state of this technology and where we are heading towards. You can download it here. Created and launched as a project of the One Hundred Year Study on AI at Stanford University(AI100), the AI Index is an open, not-for-profit project to track activity and progress in AI. This report looks at activity and progress in Artificial Intelligence through a range of perspectives. 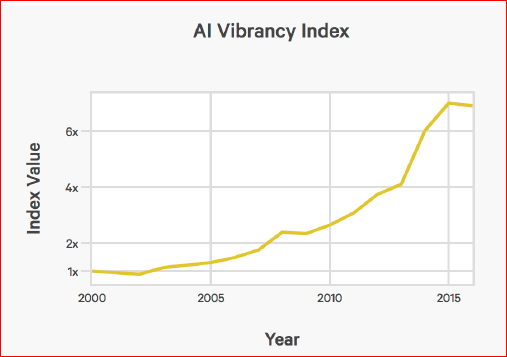 The AI Vibrancy Index aggregates the measurements from academia and industry (publishing, enrollment and VC investment) to quantify the liveliness of AI as a field. To compute the AI Vibrancy Index, we average normalized publishing, enrollment and investment metrics over time. Towards Human-Level Performance? : Short list of notable areas where AI Systems have made significant progress towards matching or exceeding human performance. This details all the games where AI has proven to surpass strongest known human competitor. You can see sudden progress in AI after 2011, and more stronger after 2015. This is pretty much it – the content report provides us. However, it is quite important to understand what’s missing in the report so we read the results in right context. The report’s data is mainly sourced from USA, which makes it a very local report, rather than providing a more holistic view. The report ends with expert columns by lot of prominent people in AI, including Andrew Ng(Coursera) and Sebastian Thrun( Udacity). Most of them have expected to see the report more internationally derived, among other wishlists. Towards the very end, every single data source is mentioned with detailed inputs on how the metrics are derived. Next Next post: Art & Craft : Welcome back Card for Daddy Dear!